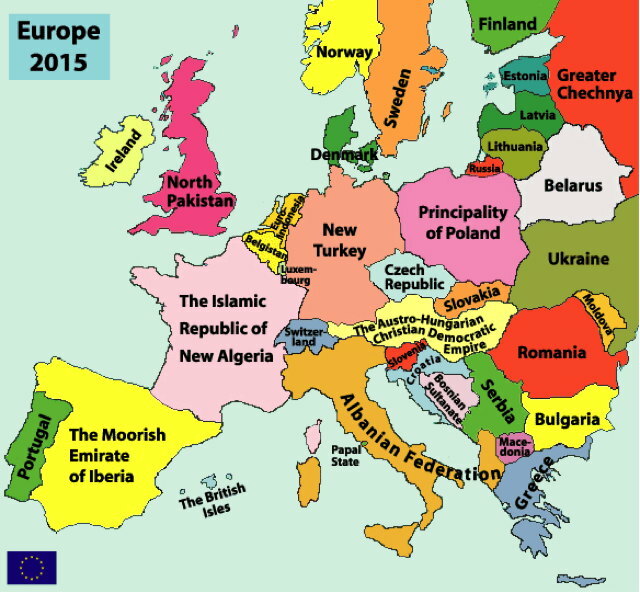 Zombie of Zomblog: "I Predicted Europe’s Future in 2004 — and Now I’m Depressed"
I didn’t foresee that each nation would no longer merely import their own pet Muslims (Turks to Germany, Pakistanis to Britain, Algerians to France, etc. ), but that it would turn into a pan-Islamic colonization of the whole continent en masse. Also, having started assigning humorous new names to the nations in central Europe, I ran out of ideas after a few minutes and just abandoned the theme halfway through, leaving most of Eastern Europe and Scandinavia with their original names. But interestingly, I did predict that it would be the Hungarians and the Swiss who, among all central European nations, would most actively resist the immigration — exactly as is playing out today. How could I have known that? The left (most of Europa) worships the god of diversity and can not even conceive of the possibility that one culture or race of people might be inherently superior to another. They have blindly allowed a completely hostile culture to invade their country(s) (and believe me it is an invasion) and destroy their cultures. This is the beginning of a new dark age. Facts are facts and not racial weapons. A fundamental truth: given a perceived need, there is no race more implacably murderous than White folk. we have no problem carrying a concealed weapon or having a weapon in the home to stop a threat to life and limb which usually leaves the perpetrator dead. We have a problem, it seems, waging war on a radically psychopathic ethnic group that has killed, raped, maimed, enslaved, brainwashed and destroyed other people since oh, about 1200AD. to lay waste to their crop lands and salt their wells, to destroy their buildings such that no two stones lay atop one another. The justification, if one is needed, is that the Muslims are Evil. Whether we are spiritual or worldly, believers or atheists, young, old, gay or straight, male or female, White or Black, or any other combination of the above, the paradigm in which we all repose dictates that some things are good, some bad, and some Evil. I agree with your conclusion. But I don't think Caucasians have a monopoly on mayhem since 1200 AD. I could give endless examples (like Hutu/Tutsi, Mao, etc. ), but you already know about them. We've reached the point, I think, where Islam should be declared a world outlaw religion. Sort of like a world historical site, only better. 'Outlaw', in the Old West sense: Islam should be a free fire zone. Give up Islam or die. That's the choice. Cash bounties would help. But I would settle for Donald Trump's vision: deport them all. There is no excuse for allowing in hordes of anti-American Islamists, when there are literally millions of square miles of land available in the Midddle East, in Manchuria, in Siberia, in North Africa, and in many other sparsely populated locations. They want to invade America for only two reasons: for all the taxpayer loot available, and to spread Islam until America is a Caliphate. "They want to invade America...."
Well, when they get here make sure to let me know, K? BTW, that shits been going on for centuries right? Why are they waiting til now to invade the US? I believe almost nothing the msm puts out, and hardly suffer any exposure to it.